Our ancient Sears Kenmore electric clothes dryer (which is not matched to the never-sufficiently-to-be-damned HE3 washer) started squeaking again. The last time it did that, I tore it apart and determined that the rear seal between the drum and the back panel needed replacing; I ordered the seal, buttoned up the dryer, and, amazingly, the squeak Went Away. The box with the new seal arrived a few days later and has been perched atop the dryer for the last few months. Never borrow trouble, sez I. Unlike the HE3 washer, tearing the dryer down isn’t a big deal. Two screws secure the lint trap enclosure to the top panel; be careful about not dropping them down the chute. Then push the top forward and pry it off the clips holding it in place. You do not need to remove what looks like clips holding the top to the back panel; they’re sort of hinges that let you tilt the top back. With any luck, you can let the top hang; I rested it on the nearby laundry sink. The drum has two sliding seals that bear on the front and rear panels. There is nothing else holding the drum in place, so when you remove the front panel, the drum falls out. It’s helpful to have an assistant holding the drum in place, perhaps with a hand through the open door, while you jockey the front panel out of the way. Have your assistant continue to hold the drum while you memorize the path of the drive belt around the tensioner and motor pulleys. This is not obvious: you don’t have to take the tensioner pulley off the shaft to remove or install the belt. 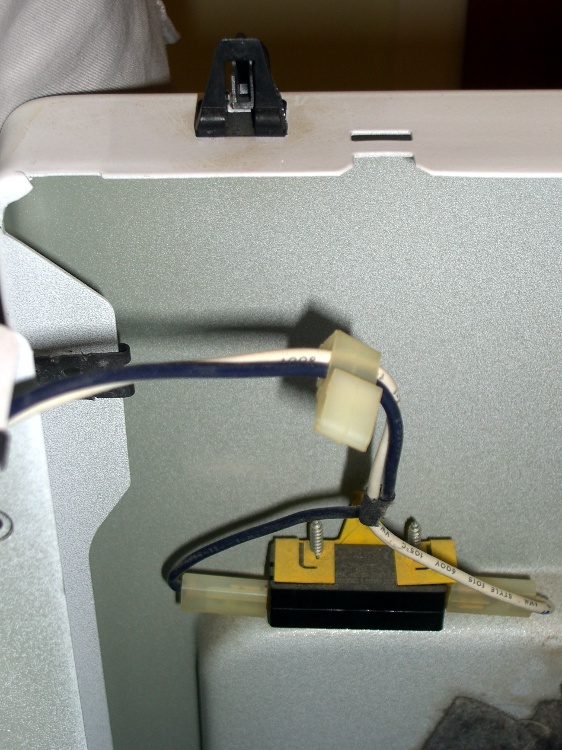 There are two sets of slots in the dryer base plate that could hold the tensioner. Only one set will work. 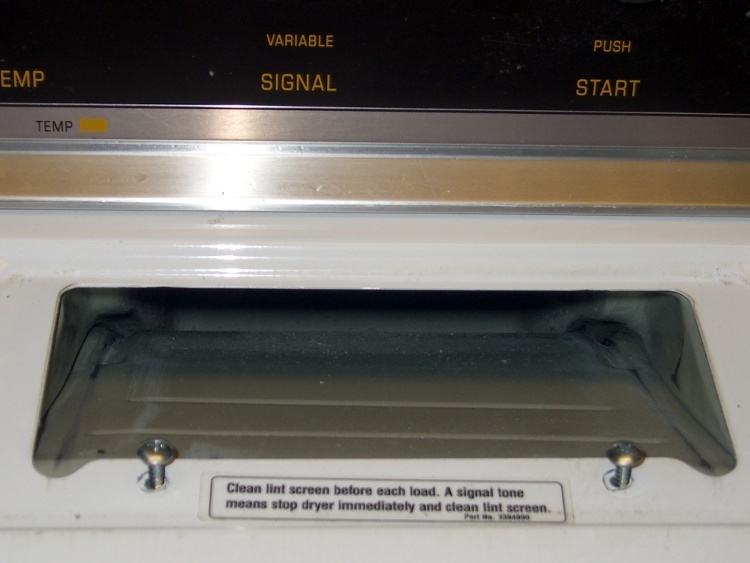 Pay attention to the situation in your dryer. 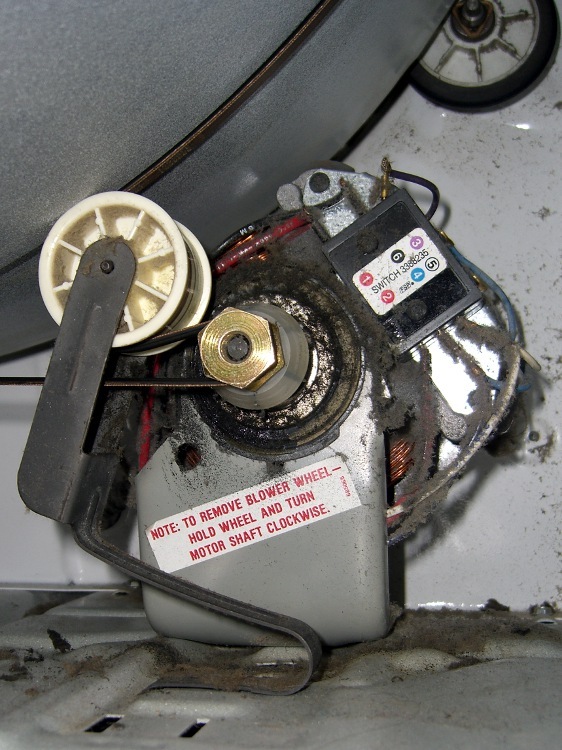 Hint: the drum rotates counterclockwise as you view the front of the dryer. The motor pulls the belt off the drum and the tensioner acts on the slack side of the belt. If you try rotating the drum clockwise, the tensioner and motor make graunching noises that will convince you something has gone terribly wrong. It hasn’t, you’re just turning the drum the wrong way. I cut the threads at the seam holding the ends of the old seal together and peeled it off the drum. That reveals the dried adhesive all around the drum. I applied xylene to soften the adhesive, then used a razor knife and a vast quantity of rags to remove the goo. The key is to get enough xylene on the adhesive to get its attention without slobbering solvent all over the drum; it will soften the paint, which is a Bad Thing. Do this in the garage or outdoors to enhance Family Harmony. I did a trial fit of the new seal, which showed it’s a snug fit and requires careful alignment. A dozen small clamps held successive parts in place while I got it settled. 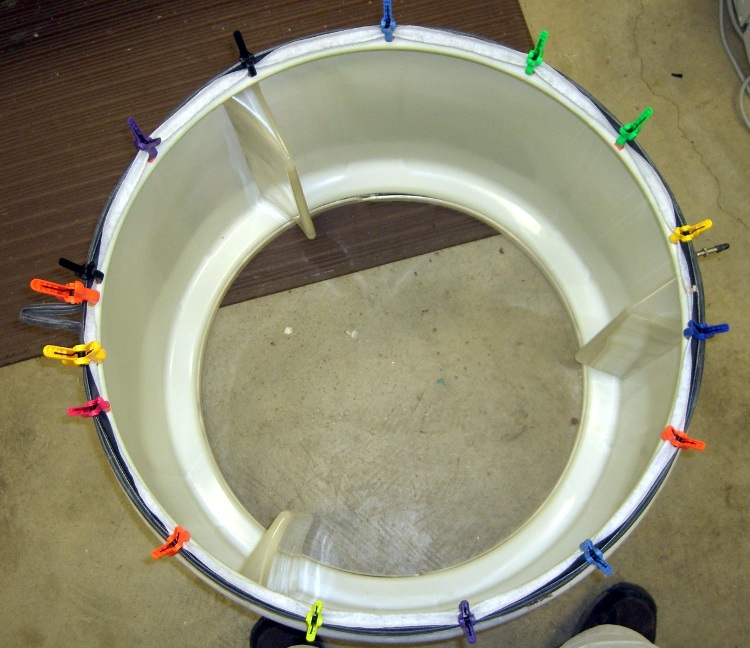 The trick is to position the center part of the T-shaped seal against the rim of the drum without wrinkles. You probably can’t get it right without a dozen clamps. To apply the adhesive, I removed two clamps, eased that section of the seal off the rim, and ran two beads of adhesive: one along the rim where the previous adhesive had been and a smaller bead just below the folded metal edge. That pretty well smeared out as I eased the section back in place. Then remove the next clamp, ease that section off the rim, apply adhesive, and iterate all the way around. I dug a patched bicycle tube out of the drawer and eased it under the clamps around the drum, then pulled it mildly taut all the way around to apply uniform pressure to the seal. Two larger clamps held the slack ends in place. After supper, we declared the adhesive (which looks & smells a lot like plain old contact cement) to be cured. Off came the clamps and tube and, lo and behold, it’s all good. Reassembly is in the obvious reverse order. The instructions packed with the seal remind you to ease the loose end of the seal outside the drum where it can ride on the back panel. Make it so. While your assistant holds the drum in place, reinstall the tensioner and route the belt around it. The belt in our dryer has two possible positions on the pulley (it has ridges), so I made sure it was tracking in the same position as before. Attach the front panel, rotate the drum a few times to be sure everything is in place and tracking correctly, then slam the top, screw it down, and you’re done! This entry was posted on 2010-09-06, 07:30 and is filed under Home Ec, Machine Shop. You can follow any responses to this entry through RSS 2.0. Both comments and pings are currently closed. Great website! I was reading though it and I thought I’d help out (even though this fix is already complete). This might save you some heartbreak in the future when you’re trying to remove adhesive residue. 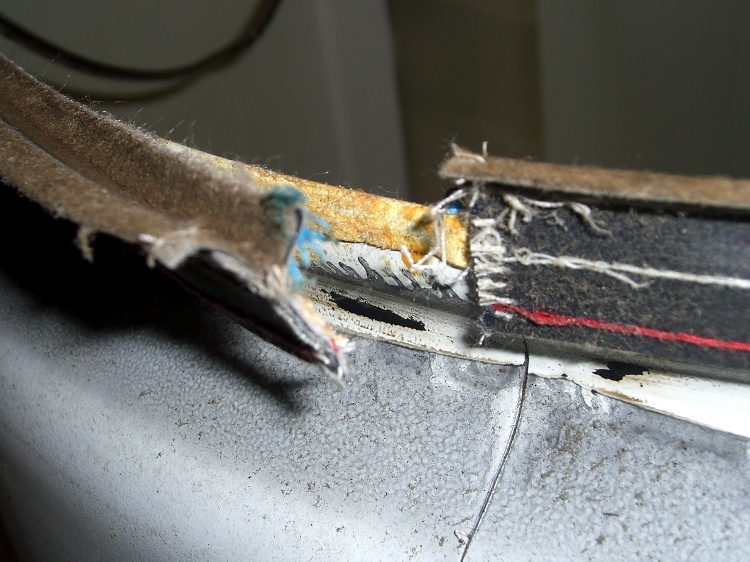 We regularly have to remove strips of residue 3″ x 15′, so we’ve perfected this process. Fold a rag into quarters or eighths (depending on the thickness of the rag and the size of the job). Put the rag between the layers of Scotchbrite, making a tight sandwich. Pour just enough solvent on the sandwich that it is saturated but not dripping. Your choice of xylene is good. This will simultaneously scrub and wet the residue. When I switched from the wet rag method to this method, the job took about an hour less. I use this on paint that is very sensitive to solvents, and a side-effect of getting it done faster is that the paint is much less damaged when you’re done. Thanks again for taking the time to post your repairs. I try hard to not remove gunk like that, but I just bought another can of xylene… I’ll put the stack of scrubby pads right next to it.